JMS has been busy conducting deadweight surveys, inclining experiments, and stability analyses for a wide variety of ship types. In the past year inclinings have been performed on several tugs, WWII vintage amphibious passenger vessels, tank barges, Subchapter T crew boats, and two tank ships. The U.S. Army Corp of Engineers required stability calculations for three Drift Collecting Vessels; HAYWARD, GELBERMAN, and DRIFTMASTER. It was desired that all 3 vessels’ stability letters be upgraded to allow towing and/or lifting operations in partially protected waters. Calculations were also needed to demonstrate the ability to accommodate an increase in the GELBERMAN’s crane capacity. Additionally, it was desired that the HAYWARD and GELBERMAN admeasurements be reduced. Inclining experiments were performed for all vessels and stability packages were submitted to the U.S. Coast Guard for issuance of new Stability Letters. The DRIFTMASTER required the installation of watertight deckhouse side doors to satisfy stability criteria. And based on new tonnage calculations, feasibility and recommendations for HAYWARD and GELBERMAN tonnage reduction were also presented. JMS conducted a stability test for a modified DUKW amphibious vessel operated by Boston Duck Tours. Recent recommendations by the National Transportation Safety Board (NTSB) regarding DUKW safety (M-02-1) focus on passive measures to increase reserve buoyancy for these vessels. Boston Duck Tours is an exemplary and conscientious operator and when the need arose to refurbish the aft half of one of their vessels, Boston Duck took the opportunity to increase the normal operational freeboard by building in greater volume below the waterline. The Boston U.S. Coast Guard Marine Safety Office requested the test on NORTH END NORMA to make sure that the modifications did not reduce overall vessel stability. Previous JMS involvement in DUKW stability includes an in-depth stability analysis and computer animated simulation for the NTSB investigation of the tragic 1999 DUKW sinking in Arkansas. A HECSALVTM computer model of this vessel type was created for that effort. For this new stability test, the previous model was revised using the dimensions of the modified stern. This proved to be a challenge because of the unusual underwater configuration of these vessels and the sensitivity to changes intrinsic of small vessels. The computer model predicted a passing test result. The stability test was performed in March on the Charles River near MIT and witnessed by the U.S. Coast Guard. The full passenger load of about 4,500 lb was simulated using water-filled drums as weights. Indeed the vessel passed. MSO Boston subsequently issued a new stability letter. Poling & Cutler Marine Transportation requested JMS perform an inclining experiment and prepare intact stability calculations for the tank vessel KRISTIN POLING for submittal to U.S. Coast Guard. This vessel had been operating in protected and harbor waters, then mothballed for some period, and was now to be returned to a route that included a stretch of “partially protected waters”. Considerable work was accomplished to structure and systems. KRISTIN POLING also required a 30-year strength analysis. The vessel was inspected by JMS and a computer model was constructed using observed (measured) scantlings to calculate section modulus properties. ABS Rules were applied to determine the required thickness for longitudinal members and then reduced minimum longitudinal strength and thickness requirements were calculated. Audio gauge readings were taken and actual scantlings recorded. JMS also conducted a strength analysis of the vessel’s bow because of concern for its overhanging the drydock. A detailed strength report was prepared for the customer that compared actual versus required scantlings. Additionally, a stability analysis and strength report was prepared for the tank vessel J.B. CADDELL, similar to the KRISTIN POLING. This vessel had been in service but now, similarly, was to travel through partially protected waters for a portion of her normal route. Stability calculations were submitted and a new stability letter was issued. The strength report for this ship was conducted in a similar manner to the KRISTIN POLING. 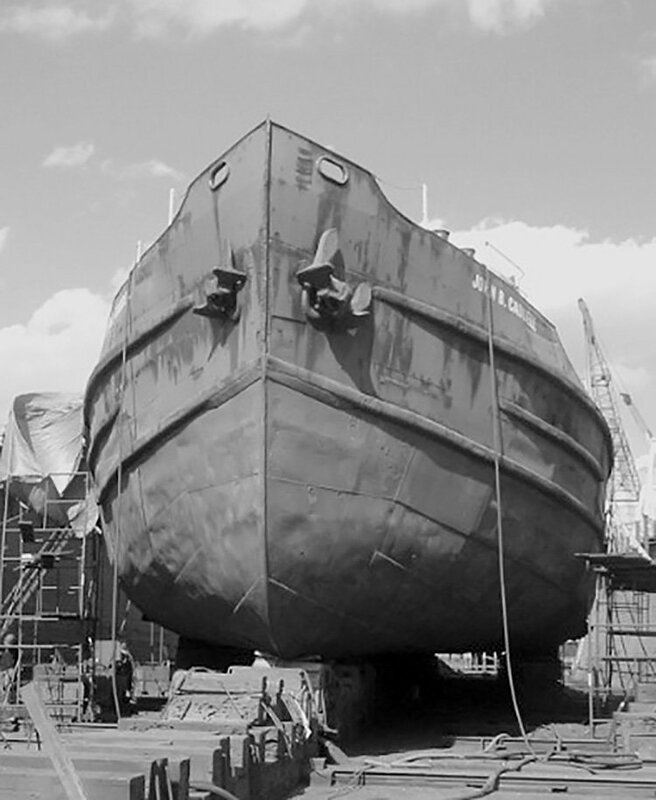 JMS designed and engineered structural modifications for the Reinauer Transportation Company oil barge BFT-38. The vessel’s cargo oil heating system boiler, boiler room, storage tank, and piping were to be removed to increase cargo-carrying capacity. JMS analyzed vessel structure and concluded that existing scantlings would satisfy ABS requirements. The modification plans were divided into three phases, simplifying the RTC in-house construction: 1) a rip out phase, 2) assembly phase and 3) installation phase. With modifications complete, ABS required a deadweight survey with stability calculations for a new stability letter. ABS witnessed the survey conducted by JMS, approved the Intact Stability Calculations, and issued the new stability letter.